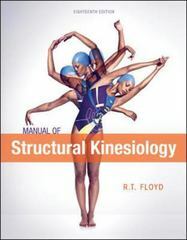 Manual of Structural Kinesiology 19 Edition Explaining the process of human movement, Manual of Structural Kinesiology gives a straightforward view of human anatomy and its relation to movement. The manual clearly identifies specific muscles and muscle groups and describes exercises for strengthening and developing those muscles. Floyd provides important information in an accessible format through a combination of logical presentation, illustrations, and concise writing style.